Product prices and availability are accurate as of 2019-04-12 02:50:24 EDT and are subject to change. Any price and availability information displayed on http://www.amazon.com/ at the time of purchase will apply to the purchase of this product. Includes one 60 watt edison bulb. Requires one 100 watt E26 type A bulb. Hardwired. Smokey gray glass. Down light. Indoor setting. Industrial style. Made from glass, steel and electrical components. Oil rubbed bronze finish. Assembly required. Shade width: 10 in.. Overall: 9.85 in. Dia. x 12.21 in. H (2.9 lbs.). This 1-light semi flush mount features oil rubbed bronze finish that will complement many loft, urban, industrial and transitional decors. 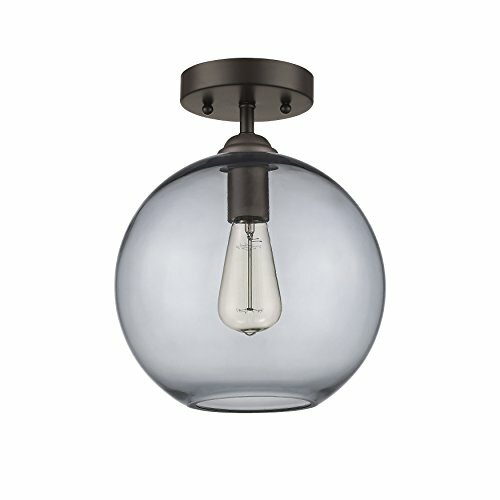 The unique shape of the smokey grey glass shade adds interest and showcases the old fashioned Edison bulb included.